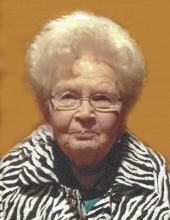 C. Faye Cummings, 88, died Wednesday, January 2, 2019, at her home in Vinton due to complications of Parkinson’s disease. A memorial service will be held 11:00 a.m. Saturday, January 19, 2019, at Oak Grove Church in rural Shellsburg with Pastor Matt Magee and Pastor Larry Rodgers officiating. Visitation will be held from 4:00 to 7:00 p.m. Friday, January 18, at Van Steenhuyse-Russell Funeral Home, Vinton. Private family inurnment will be held at a later date in Evergreen Cemetery, Vinton. Faye was born July 23, 1930, on her family’s farm near Atlanta, Missouri, the daughter of David Olin and Celia Venora Hall Baldwin. She was a 1949 graduate of Lincoln High School in Vinton. On June 3, 1951, Faye was united in marriage with William E. Cummings at the Assembly of God Church in Vinton. She worked for Fourth Street Cleaners; Dog n’ Suds; Café 218; and was a salesperson for Hasbro toys, Home Interiors and Avon. She was a cook for the Vinton school district for many years, retiring in 2000. Faye was a member of the Assembly of God Church in Vinton for 60+ years prior to attending Oak Grove Church. She was a Cub Scout den mother and enjoyed flower gardening, sewing and collecting angel statues. Above all, she cherished time with her family. Faye is survived by her husband of 67 years, Bill Cummings, of Vinton; her children: Wm. Craig Cummings, Jeffrey Cummings and Rachel Morarie, all of Vinton; siblings: Joan (Don) Anders of Newhall; Pat (Larry) Davis of Urbandale; Edwin (Beverly) Baldwin of La Porte City; and Mardene (Gary) Schulke of Flagstaff, AZ; 11 grandchildren; 12 great-grandchildren; and one great-great-grandson. She was preceded in death by her parents; one son, Doug Cummings; daughter-in-law Lori Cummings; sister and brother-in-law, Nola and Alvin Lindahl; brother-in-law Don Werning; and grandchildren William R. “Billy” Cummings and Sara Jean Cummings Bunch. To send flowers or a remembrance gift to the family of Faye Cummings, please visit our Tribute Store. A fund has been established. "Email Address" would like to share the life celebration of Faye Cummings. Click on the "link" to go to share a favorite memory or leave a condolence message for the family.